Starting on Monday, visitors to Toronto city hall will be subject to baggage screens before accessing certain areas of the building. The change is the first of a host of enhanced security measures set to be implemented in the coming months. Anyone entering the main floor rotunda from the west and east doors, as well as from Hagerman Street, will first have to pass through a baggage screening area, the city said Friday in a news release. Toronto has joined other cities struck by vehicle attacks — what can it learn from them? The screens, which include a "visual inspection" of bags, will be conducted by contracted security guards. No screening will be necessary for anyone accessing city services like the library or the Service Canada centre in the rotunda. 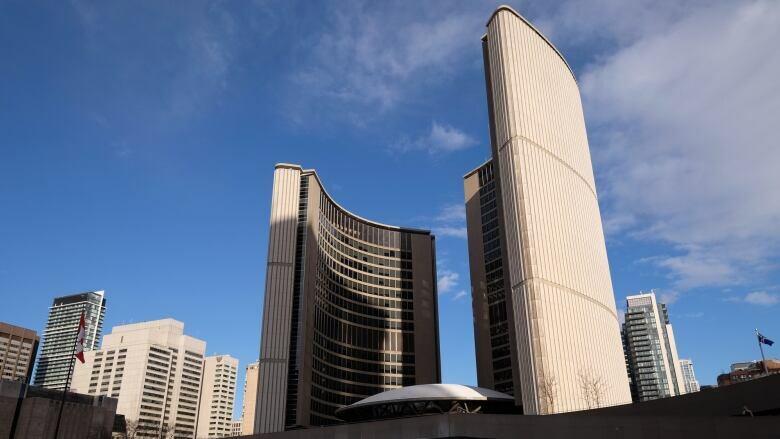 "The safety of all those who work, visit or do business at city facilities is the top priority of the City of Toronto," said Dwaine Nichol, director of corporate security. "These security measures strive to seek a balance between enhancing our current security measures from foreseeable threats while still maintaining an appropriate level of public access to city hall." The upgraded security comes after council voted in June to approve a host of new measures, including walk-through metal detectors at the entrance to council chambers and more guards on the premises. Those changes are expected to come into effect "later this year," the city said.